A few Sundays back we made another trip to the Burgess-Shadbush Nature Center for some caching. While waiting for others in the group to arrive, Chris (of TeamLegend4) and I spent some time working the new cabin onsite. This small iron bell was screwed next to the door frame of that structure. 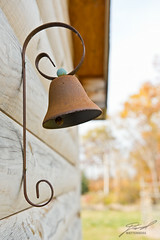 We spent several minutes on this bell, mostly teaching Chris to use the Nikon D200 I'd lent her. Of the three difference compositions I'd had, this was my favorite. I'm anxious to see what she had.